Graves Light was completed on-time and on-budget, its massive first order Fresnel lens going live on September 1, 1905. 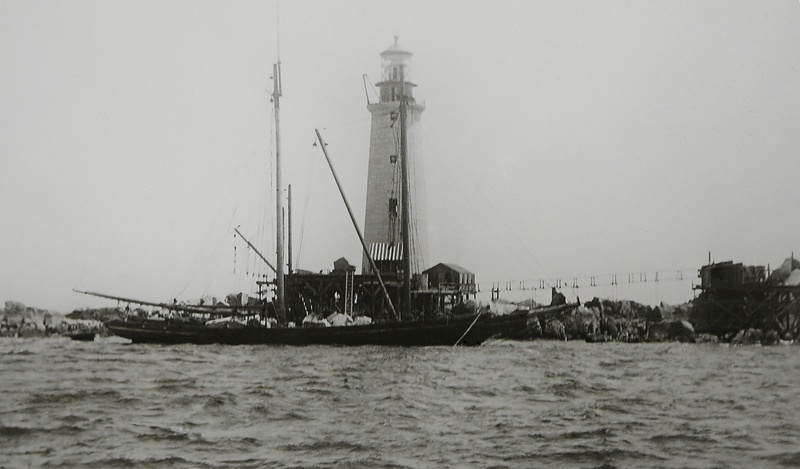 Click on the photo to expand, and look carefully at the lighthouse: The 12-foot tall first order Fresnel lens is installed and a striped awning shelters the dock, but the windows in the tower are not yet in place, and the entrance door, 40 feet above sea level, does not appear to have been in hung yet. By this time, craftsmen are probably at work on the glazed brick interior, and installing wooden flooring, mahogany stair rails and paneled oak ceilings that had been crafted in Portland, Maine. They don’t make anything this solid anymore. 7ft thick walls and 4inch thick bolts…This was a very well constructed lighthouse. I can imagine the storms and hurricanes that have beaten this building over the past 100 plus years.